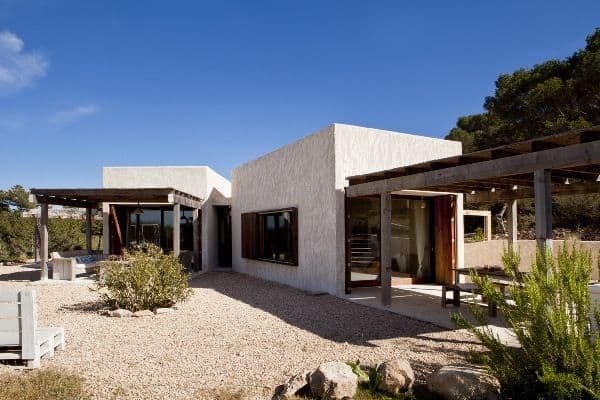 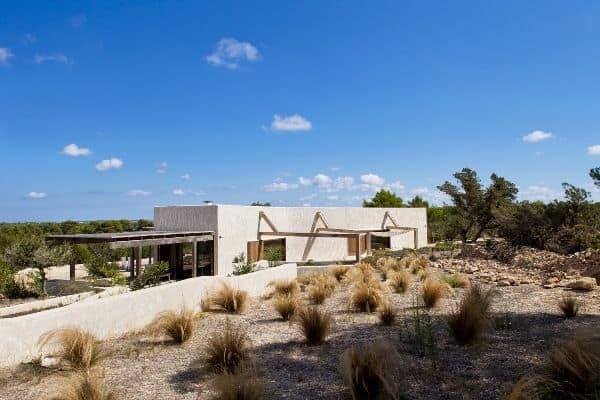 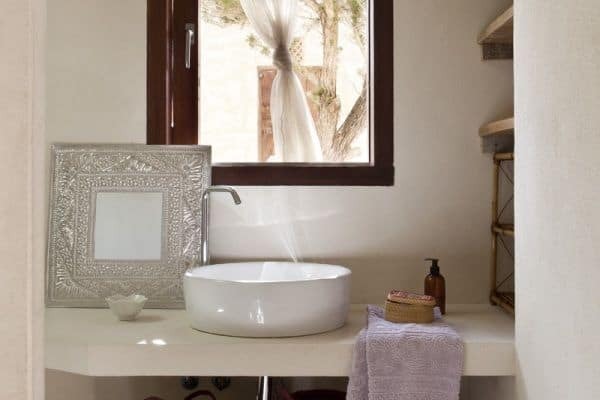 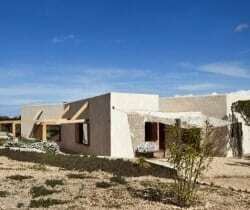 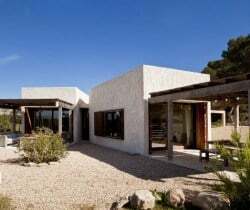 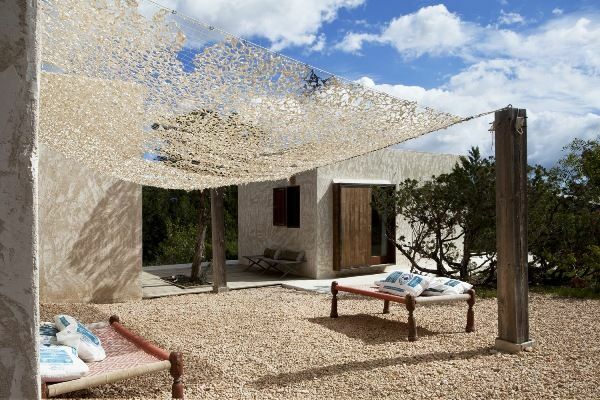 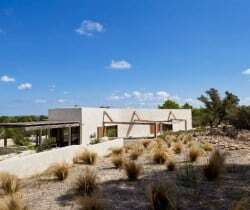 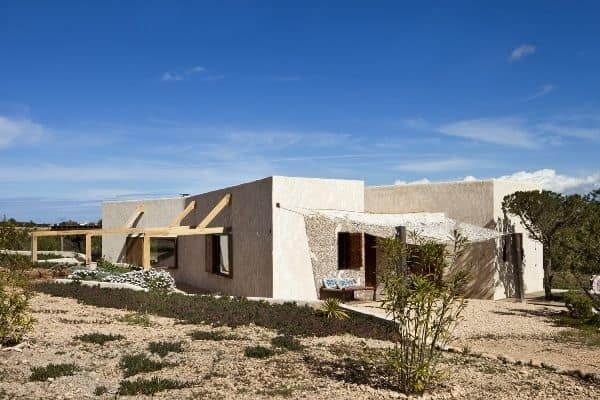 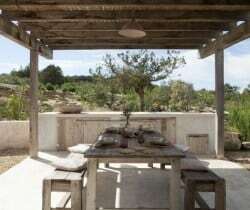 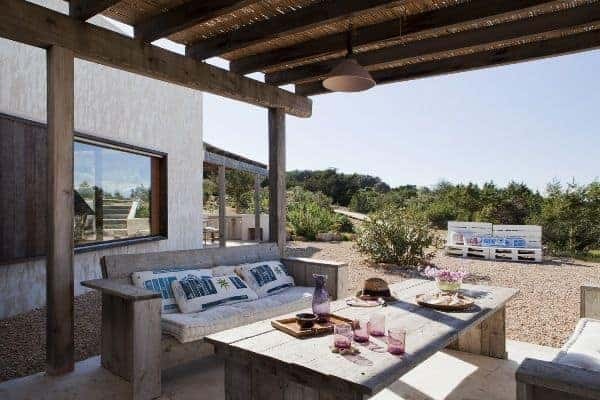 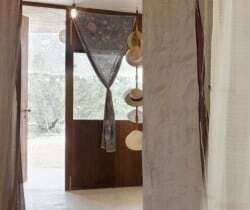 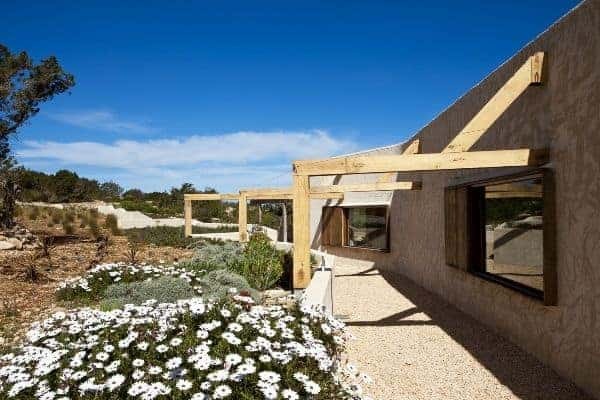 Unique architecture, bohemian chic, woodland seclusion, natural simplicity and meticulous attention to detail are the sum parts of a lovely luxury villa located in central Formentera. 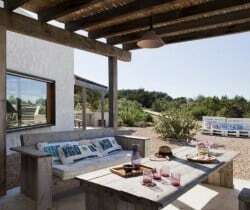 Everything here is in the right place and nothing is superfluous, the quality of relaxation and comfort is high and the latest technology is available (including iPod speakers and Wi-Fi). 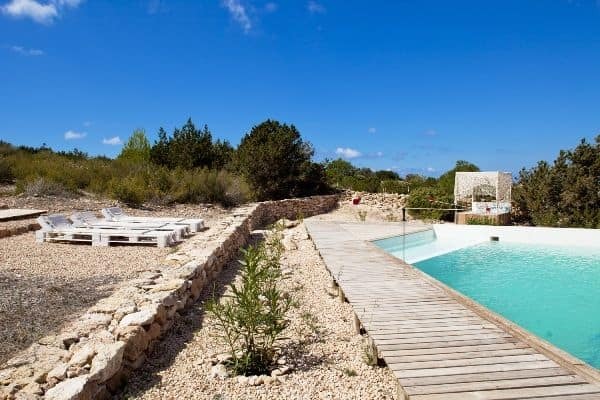 The closest beach is the popular and white sand of Cala Saona, which is only a 10 minutes’ drive from the property, which is itself 4.5 km from the main town, San Francesc. 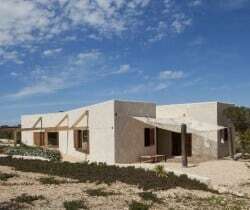 Built as a fortress against Barbary pirate raids in the 18th century, the town nowadays is the setting for many of the island’s festivals and is also good place to browse leisurely in and around the shops and colourful crafts and market stalls, or to simply sit at one of the bars with a coffee or aperitif or ice cream to indulgently enjoy the world passing by. 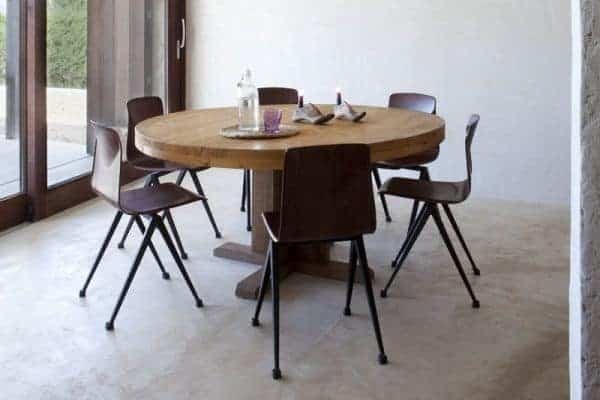 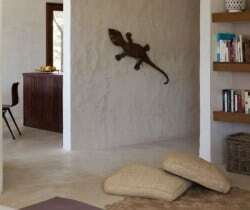 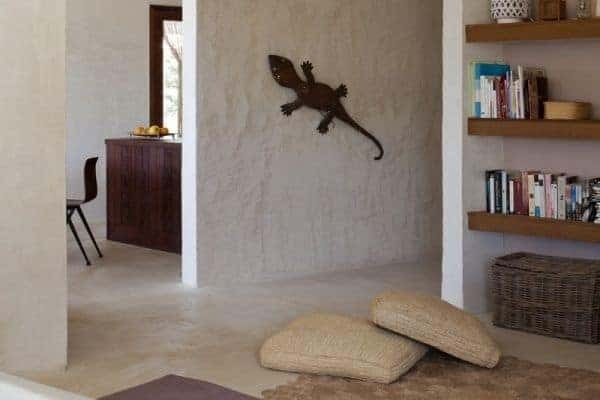 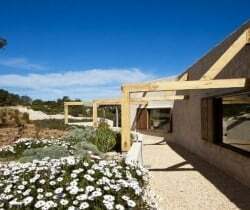 The villa is owned by an interior designer and a photographer and is constructed of local natural materials to readily assimilate with its surroundings. 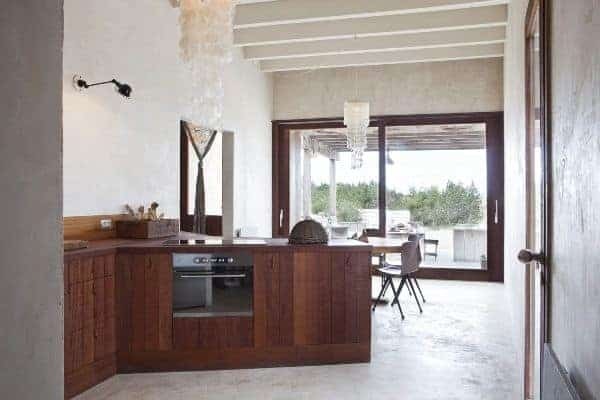 Rustic and functional, there is an impressive amount of open space inside the villa’s cubic arrangement of connecting angular squares, sharp corners and high archways. 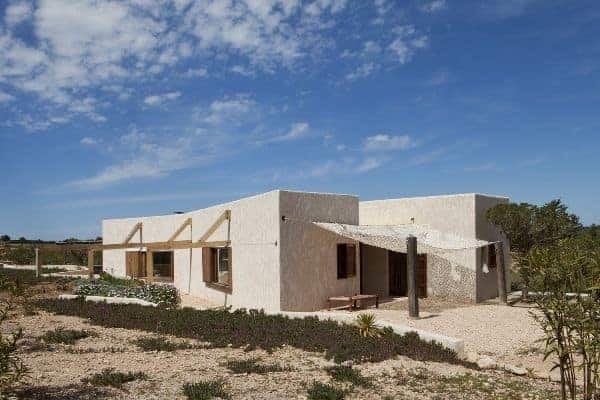 Concrete flooring provides welcoming and cool comfort in the hot and dry climate and the ‘décor is aligned with the island’s laid-back aura. 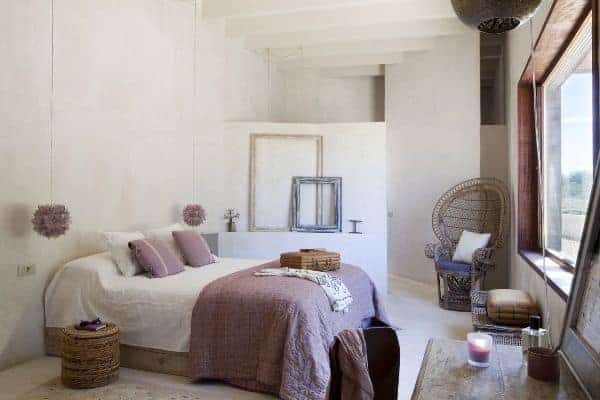 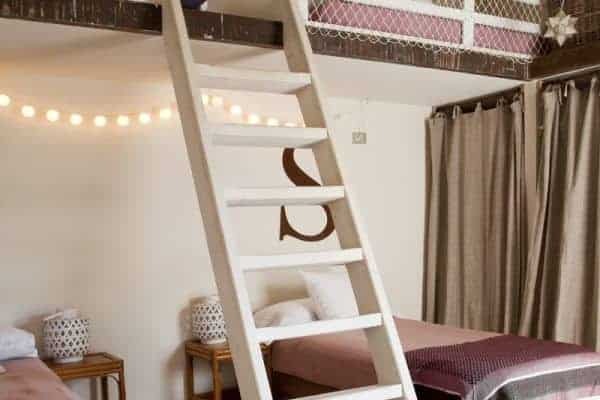 The décor is a chirpy and hip blend of soft neutral colours, subtle purple-lavender accents, wood beams, roughly plastered walls, linen and silk drapes, plunging light fixtures and even an indoor hanging chair. 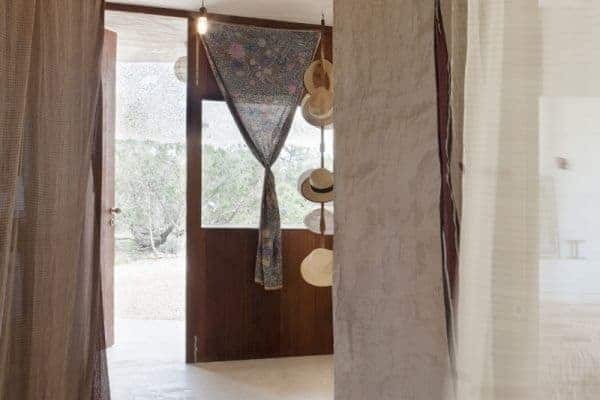 Friends visiting can stay over in the lovely guesthouse, which is a private and independent annex with a double bedroom en suite. 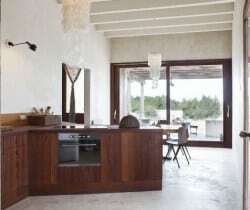 With just 3 lovely bedrooms en suite, this luxury villa is a comfortable home for 8: ideally 4 adults with 4 kids in one bedroom. 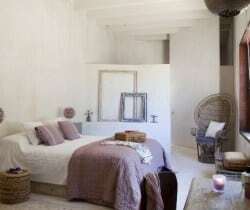 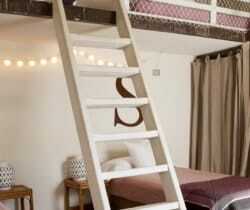 The two double bedroom suites have a bath and shower and one (in the main house) has also a dressing room. 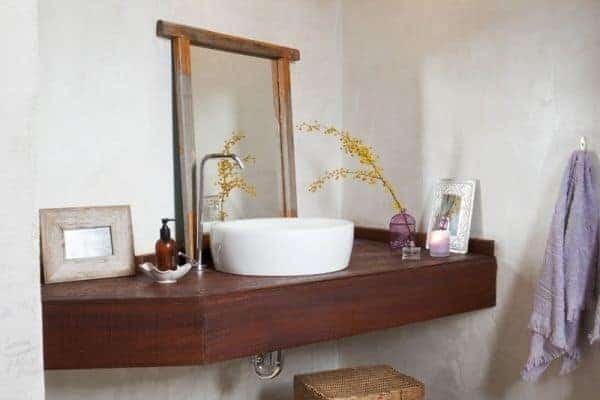 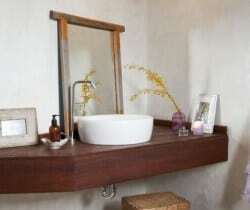 The bathrooms are attractively styled with dark wood and rustic beige finishes and the breezy living room (which has a fireplace) opens onto a terrace with an outdoor chill-out space shaded under a pergola. 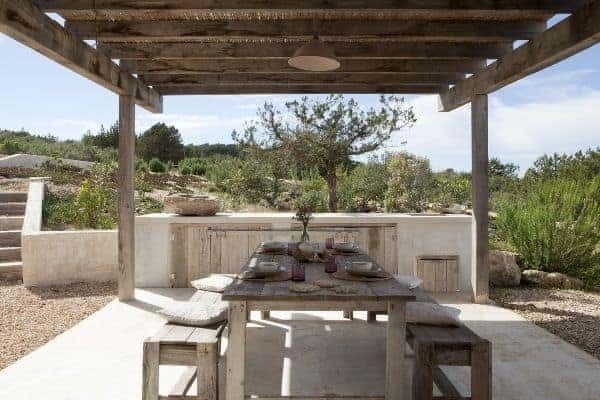 It’s a delightful spot for fresco meals too and there are various other spaces, some of which are furnished and some not shaded in and around the landscaped wild garden. 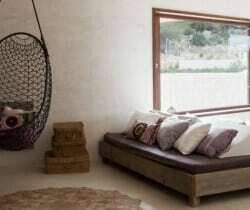 Here it can be possible to relax in solitary repose, read a good book and enjoy a siesta snooze. 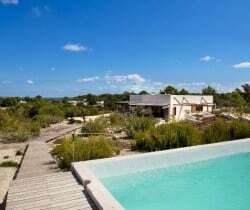 Meanwhile the kids can splash about in the decent-sized swimming pool, which is sunken into a triangular sundeck that is an extension of the elevated walkway from the villa to poolside. 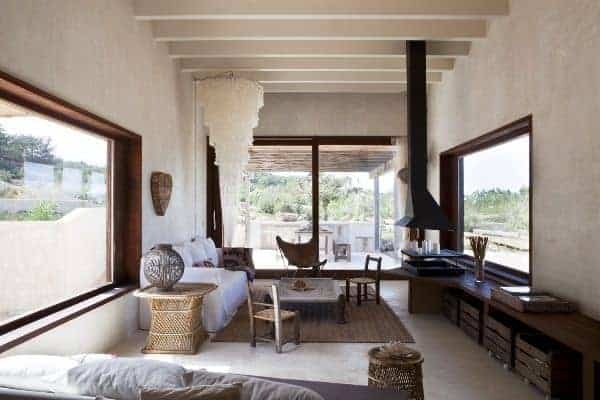 While the children play in sight, the grown ups can relax in the sunshine on a choice of comfortable loungers and a massive Balinese bed. 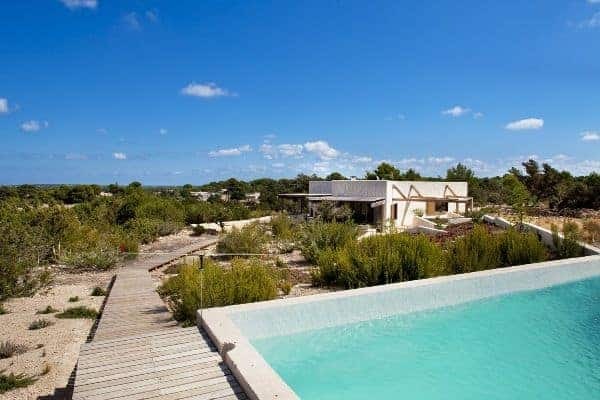 The villa effortlessly and harmoniously engages with its environment and offers the luxury of privacy, space and peacefulness in this“last Mediterranean paradise”. 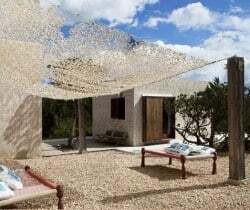 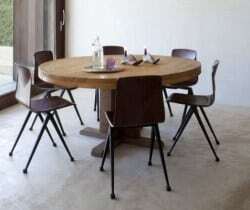 This is an ideal family and holiday home that kids will enjoy and where the adults can enjoy unobtrusive relaxation.